Columbia Outdoor School offers a safe and inclusive camp experience for all campers ages 6 to 12. Camps will begin and end each day at the Idlewild Scout Hall in Cranbrook. This location offers access to an indoor recreation area, outdoor fields, a park, skating rink and tobogganing hill. Day Camp will include off-site trips to the Western Financial Place pool and ARQ Mountain Centre. Day Camp offers extended care of an additional fee per day from 7:30am to 6:00pm. Please note, a late fee will be applied to late pick-ups. 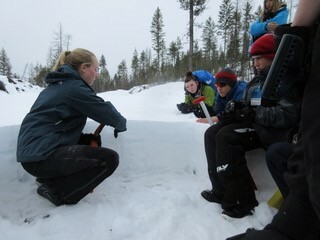 Spring Break Camp offers an "unplugged" winter experience in the great outdoors! Blue Lake Camp is the perfect setting for unique winter programming that is fun, develops lifelong skills, and helps campers see the best in the themselves and others. Blue Lake is one of a kind in our region providing traditional camp programs with special activities related to winter recreation. Activities include skating, broom ball, nature hikes, snow studies, camp fires, NEW low ropes course, and more. Program fees include meals, accommodation, programming and 24 hour supervision. Register below! Want to spend your spring break exploring, gaining new skills and meeting new friends? Join us at Blue Lake Camp as you become part of a tightly knit team of outdoor leaders. During this seven-day wilderness adventure you will develop outdoor survival and leadership skills, work with your team to navigate the back country, survive the elements and test your new skills on an off-site winter camping trip. With the help of our energetic and qualified program facilitators, participants will learn how to trip plan, navigate, build a shelter, manage risk in the back country and much more while ultimately developing their leadership skills. No previous experience necessary, just an enthusiastic attitude and a love for the great outdoors! 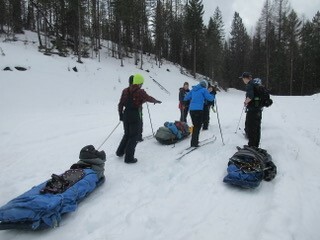 Included in cost: meals, accommodation, snow shoes, cross-country skis, and programming. Not included: personal pack, sleeping bag, sleeping pad, personal clothing and toiletry items. Camp is an active place and full bellies are important to help keep energy levels high! With this in mind, Blue Lake Camp offers delicious, nutritious, filling meals with vegetarian options. Campers receive three meals a day in addition to an evening snack with hot chocolate. Fruit is available all day for campers needing something extra. Nut products are not permitted at Blue Lake Camp. With advance notice, we are able to accommodate some special diets.